April can be a fantastic time of year to get away and enjoy a city break. For many of our readers, it’s a time when temperatures are just starting to pick up a little, when destinations are beginning to open their doors more to tourists, and yet it isn’t a peak time to travel… meaning less crowds and more competitive rates across the industry. We spoke to a number of experts and came up with a list of 14 of the best places to travel this April. Read on to discover more. April is an extra-special time to visit Rome, as the 21st April is Rome’s birthday. Not every city celebrates its birthday, but in Rome festivities are held throughout the city. The occasion is known in Italian as Natale di Roma, and it is an important festivity for the city. Rome was founded on 21st April 753 BCE which makes it 2771 years old in 2018. The biggest Natale di Roma event takes place at Circus Maximus from Fri 20th- Sun 22nd April. The fun-packed schedule for the weekend includes historic re-enactments, gladiator games, photography exhibitions, equestrian events and live music. The highlight of the event is the huge parade taking place on Sunday 22nd April, which sees more than 2000 participants taking to the streets dressed as gladiators, senators, priestesses and more. All of the Natale di Roma events held at Circus Maximus through the weekend are completely free to attend. Additionally, all city museums offer free entry on 21st April, meaning you can visit everywhere from the Capitoline Museums to the Galleria Borghese and even the Colosseum completely free of charge. Another special event happening on Rome’s birthday is the annual opening of the beautiful Roseto Rose Garden, which is home to an incredible 1100 different types of roses. April is also the ideal time for experiencing a pleasant climate in Rome, which is an important factor to consider given how much time in Rome is spent walking around the city. Summers in Rome have become increasingly warm in recent years, and some tourists can find summer temperatures uncomfortably hot. Spring is a far more comfortable time to visit weather-wise, and April offers a cool but sunny temperature, and minimal rainfall. Temperatures average around 20C through the month, making April the perfect time for walking around Rome and seeing the eternal city’s many historic sights. This season also produces some of the finest local cuisine in Italy. One of the finest Italian delicacies to enjoy in April is artichokes, which are a local favourite. There are many types of artichokes available in Italy, but the locals’ most-loved artichoke is carciofo romanesco, also known as mammola or cimarolo. Another seasonal speciality in April is fava beans, which you will find freshly available at market stalls throughout the city. Fava beans are cooked with artichokes and peas to make the local dish Vignarola which is often mixed with pasta or Bruschetta for a tasty spring snack. While it’s not peak tourist season, April is widely-regarded as one of the very best times to visit Havana to experience the best weather conditions. In April in Havana, you can expect warm and dry climates of up to 29C during the day, with cooler temperatures of around 19C in the evening. This is perfect for soaking up the sun on the city’s stunning white beaches during the day and enjoying Havana’s lively nightlife in the evening. April is also a reliable time for avoiding hurricanes or rainfall in Havana. Additionally, as April is slightly outside of the peak tourist season in Havana, this is a great time for exploring the city without crowds of tourists – and it also makes it easier for you to snap up a great value luxury stay for a lower price. Experiencing Havana outside of peak-season also allows for a more authentic experience of this fascinating cultural gem. Havana is steeped in history and culture and being able to explore the city free from crowds allows you to genuinely discover what makes this city truly unique and wonderful. April is also a fully-packed month for events and festivals in Havana. The Ritmo Cuba International Salsa Festival is one of the best salsa festivals in the world, and will be taking place in Havana between 23rd- 29th April 2018. The festival offers salsa lessons for expert instructors as well as live salsa bands, beach parties and tours of Old Havana. Elsewhere, classical music fans will enjoy the Chamber Music Festival being held in Havana between 18th- 25th April 2018, while those with a taste for electronica music – an increasingly popular style of music in Cuba – will want to head to the Proelectronica Music Festival between 14th- 23rd April. Acoustic fans looking for a more relaxed vibe can head to the bi-annual Guitar Festival and International Contest which brings together the best guitar players from around the world. The festival will be held between 17th- 24th April. Whatever your tastes and interests you’re sure to find a music or dance festival to suit you in Havana during this time, and it’s also the perfect opportunity to try out something new. Where better to learn how to salsa dance than in the colourful and charismatic city of Havana? With the end of the winter comes the beginning of the warm days in Barcelona. April marks the start of the good season for outdoor activities, easily enjoyable in and around the city. From a winery visit to touring the old town to enjoying a nice paella on the seaside, you’ll enjoy perfect weather- sunny most of the time, yet not as hot as summer time. You’ll avoid the cold, windy winter days and the hot, humid summer days. Funny enough to notice, not too many people seem to know about that, as the touristic high season really starts at the end of April, attaining peaks from May to September. By going to Barcelona in April, you’ll enjoy all the benefits of the high season but without the hordes of tourists, or at least depending on where you go with much less than in Summer. Recent political events have led people into thinking Barcelona had become an unsafe destination. No need to say, travelling to Barcelona has never been safer. And this sudden drop of visitors at the end of 2017 has had as a result a drop in prices too. While budget services’ prices have stayed level, mid to high-end touristic services such as accommodation and tours have dropped their prices to attract their customers again. This is a great opportunity to take advantage of those prices, as they should not stay low for long in my opinion, since tourism is slowly but surely taking off again in Barcelona. Last but not least, April marks the start of plenty of local summer festivities such as Sant Jordi, the local Valentine’s Day. Unlike the rest of the westernised world, Barcelona locals celebrate the day of love on April 23rd. And they do celebrate it in a quite different way. Indeed, for this special occasion, men offer a rose to the women they love (red for the lover, and even sometimes their mother, and other colours for female friends) while women offer a book to the men they most cherish (that may include their father and friends). On this special occasion, the streets are packed with improvised roses and books sellers, and local people wandering around to find their loved ones a special gift, or just to take a look at what’s been offered. This offers a truly magical atmosphere for the visitors passing by, who may even join the tradition. Puerto Vallarta is unlike any other resort destination in Mexico. Nestled between the lush jungle of the Sierra Madre mountains and the blue Pacific Ocean of Banderas Bay, the city has undergone a renaissance of sorts over the past decade, shedding its all-inclusive, package vacation reputation and growing into a world-class, luxury travel destination. And there is perhaps no better time to visit this Mexican jewel by the sea than during the month of April. As springtime settles into Puerto Vallarta, the Spring Break crowds dissipate, leaving the city calm, peaceful and perfect for exploring. Stroll the iconic Malecon, the mile-long oceanside boardwalk lined with impressive sculptures, restaurants and live entertainment. Visit one of the dozens of galleries in the city, many featuring the art and intricate crafts of the Huichol, an indigenous tribe native to the region. Golf the 18-hole signature Joe Finger course at the Marina Golf Club, located just 15 minutes from the downtown core, or explore Puerto Vallarta by sea in a privately chartered yacht or sailboat. With the high season over, April is also the ideal time for catching some sun on the sandy shores of Puerto Vallarta beaches. With daily temperatures averaging a beautiful 82 degrees and warm ocean waters, Puerto Vallarta offers the perfect beach day for every type of traveler. Popular Los Muertos Beach is in the heart of the city, where visitors will find beach clubs, watersports and toes-in-the-sand dining options. Or jump in a water taxi from the Los Muertos Pier to explore the southern beaches, like Yelapa, Las Animas and Quimixto, which are only accessible by boat. Be it total tranquillity or full-service beach club, you’ll find it in Puerto Vallarta. And you can’t talk about Puerto Vallarta, without mentioning its incredible culinary scene. From haute-Mexican fine dining, to farm-to- table concept restaurants from some of the country’s most watched up-and- coming chefs, to the legendary street food and fresh seafood, Puerto Vallarta is a city that will capture the heart… and stomach… of any foodie. April is the prime time to visit Tokyo as the cherry blossom sakura season comes out in all its glory. Every twist and turn of the metropolis’ streets and parks become awash with a soft pink glow from the renowned cherry blossom trees, creating a magnificent sight. These budding blooms are much loved by all, and commuting crowds including your typical salarymen, pull out their iPhone cameras and compete with each other to get the best shot of each perfectly formed flower! The natural beauty of the blossom attracts many during the day, and also draws crowds in the dark when yozakura (night time sakura viewing) takes place. Some of the best spots to view the sakura in Tokyo are: Asakusa, where Sensō -ji Temple is shrouded by countless pink petals; Nakameguro canal where the rosy hue reflects in the water below; and Kichijoji koen (park) where families float around the pond on kawaii (cute) swan boats and dog walkers stroll under the seasonal lanterns. Other colourful blooms also adorn the city in April, including azaleas, which are celebrated during the Bunkyo azalea festival at the sacred Nezu Shrine, and wisteria which hangs in Kameido Tenjin Shrine over the iconic red bridge. Tokyo is alive with a buzz during April and a celebratory mood fills the air since the cherry blossom marks new beginnings – signified by both the start of the school year and business year at this time in Japan. The city temperatures are reliably warm and pleasant this month, with the morning and evening temperatures around 10.5 degrees, while afternoon temperatures average around 18.5 degrees, so many outdoor events and festivals abound. People gather in harmonious multi-generational groups for o-hanami picnics under the boughs of the trees in Tokyo’s many manicured parks, like Shinjuku Gyoen. These gatherings can become quite lively by the afternoon as many enjoy sipping on sake, the potent Japanese tipple which (like Kit-Kats, ice cream and a plethora of food and drink products) comes in special blossom-tinged varieties at the height of the season! The atmospheric spirit of the sakura season is palpable; locals are both reverential and high-spirited, recalling the Japan of old but also celebrating youthful exuberancy (especially those ojii-san (grandfather) octogenarians after a few glasses of sake). Over the course of a holiday, visitors to Japan become more than just observers, they become participators in the world’s finest cherry blossom experience. Over the past few years, the sleepy Portuguese capital of Lisbon has rapidly become a feature on bucket lists worldwide. With a low cost of living, more than three hundred days of sunshine per year, and a cuisine that includes delicacies like pastéis de nata, there are plenty of great reasons to visit Lisbon. And plenty of people will this year, with the majority descending on Lisbon during July and August – just one of the many reasons that you should visit Lisbon in April instead. Although Lisbon is the capital of Portugal, it’s quite a small city and the summer population increase does have an effect on accommodation prices, restaurant availability, and the length of time you’ll spend queuing for attracts like São Jorge Castle and the Monastery of Jerónimos. Both attractions are deserving of your time and photographs, but you’re much more likely to enjoy both when the crowds are smaller. Aside from missing the big rush, April is a fantastic month to visit Lisbon. The weather is warm, but not stiflingly hot: temperatures are typically around 20-25 °C, which is perfect weather for a city break. It’s warm enough to appreciate the sun, but not so warm that you can’t comfortably explore the city. There’s plenty to see and do in April as well, particularly around the 25th of April. April 25th is known as Freedom Day or Liberty Day, and it celebrates the end of five decades of dictatorship rule in Portugal. This is an important date within the Portuguese calendar, and one that most people outside of Portugal are unaware of. Visiting Portugal in April gives you a chance to learn a little Portuguese history, and to enjoy the festivities that go with it. If you can’t make it for the 25th, don’t worry: there’s still plenty more things happening in Lisbon in April. Dias da Música, which usually takes place close to April 25th, celebrates a full weekend of classical music at the Centro Cultural de Belém. It’s one of Portugal’s best classical music performances, and a fantastic chance to enjoy this Portuguese landmark at its best. For foodies, the Peixe em Lisboa gastronomic festival, is well worth attending as well. This festival celebrates fish and seafood, a staple of Portuguese cuisine, and attending gives you a wonderful opportunity to sample a wide selection of different regional and national dishes. In 2018, Peixe em Lisbon will run from April 5th until April 15th. But, even if you miss all of these festivals, there’s still plenty to see and do in Lisbon and it’s definitely worth your while making the trip. With an average temperature of 25°C, April is the perfect time to visit Marrakech with these pleasant temperatures for sightseeing and day trips to the Atlas Mountains. There is often still snow on the highest peaks of the Atlas at this time which can still be seen from Marrakech before the heat haze sets in the Summer. There is a little rain expected in April which is good as it keeps the dust down and clears the air plus it is not peak season so the souks are less crowded for a more relaxing amble through the stalls. This is a good time to enjoy walking tours with experts to focus on the striking Islamic architecture or to find the best shops for rugs, leather, spices and lanterns with a personal shopper. There is more availability and more comfortable temperatures (inside and out) this month for learning experiences with experts to further bring Marrakech to life through learning a local skill, such as creating your own Zellij ceramic design, making a bespoke scent with a perfume maker, photography and making lesser known Moroccan delicacies in the souks with a gastro guide. Morocco has been producing citrus fruits since the 7th Century and April is one of the best months for oranges to enjoy Morocco’s famous fresh orange juice at the souks and cafes. This month sees all the flowers coming into bloom in all the gardens. The orange blossom has an aromatic, sweet smell and it is sold in the souks as orange flower water, in patisseries and sometimes sprinkled into mint tea. April is also when the roses begin to bloom all along the sides of the streets and in gardens. Rosewater is used in both cooking and cosmetics in Morocco and the buds are used in the Ras Al Hanout spice mixture used in many Moroccan dishes. It is also one of the best times to visit the Majorelle Gardens which has the incredible magenta bougainvillea in bloom amongst many others in this two and a half acre botanical garden. New Zealand has four distinct seasons, with April arrives Autumn and Queenstown’s stunning multicoloured blaze of red and gold leaves from the temperate deciduous forests that surround the lakeside town that attracts so many local visitors as well as all over the world. With this seasonal spectacle of colourful leaves in Autumn, which disappear in the cold winter and re-appear in spring; April is the favourite month for hiking. There are many beautiful walking trails, all easily reached from Queenstown with varying length and fitness levels. The magical scenery around this time of the year is captivating, with degrees of yellow, golden and red hues reflecting on the crystal blue waters of the lakes, surrounded by white and rocky peaks. While April is not Queenstown’s peak season, you’ll find yourself meeting the locals and there is more available accommodation in many of its fabulous boutique hotels. Other things to do in and around Queenstown in April include visiting the Akarua Arrowtown Autumn Festival which is in late April and goes on for 5 days. The festival is a celebration of the town’s heritage and community and has different events such as guided historical walks, markets, concerts and much more. For a culinary experience, New Zealand is known for its world-class cuisine, a fresh and inspiring blend of new world dishes. Queenstown has some of the best restaurants and bars which makes it an easy choice for food lovers all year round. Between March and October, the famous bluff oysters are in season. Described to be the world’s best, larger than regular oysters and beyond creamy, a lot of culinary travellers go to Queenstown especially for a taste of what some describe as the “best oysters in the world”! Some restaurants design whole menus around this delicacy whereas others let you enjoy them fresh with a dash of lemon or Tabasco and a glass of champagne. Autumn wine tastings are also popular and can be easily combined with spa visits and scenic helicopter tours over the famous landscape in all its April autumnal glory. Queenstown has a beautiful selection of outstanding restaurants and bars, and in April there is nothing cosier than drinking a nice glass of New Zealand wine by an outdoor roaring fire and enjoying great company. Let’s be clear about one thing: there’s never a wrong time to visit Cape Town. But while the most popular months to visit South Africa’s most cosmopolitan city tend to be December and January, the best time of year might actually be April. The start of Autumn/Fall in South Africa, the weather is cooler and more comfortable, and offers a welcome reprieve from the height of summer when temperatures average around 35°C. That being said, however, the days are still generally clear and bright, making it the perfect time of year to get outdoors and enjoy the many hiking routes in and around the city. Ranging from leisurely rambles to more mountainous hikes with the most spectacular views, Cape Town has trails for everyone, including Chapman’s Peak and Lion’s Head, next to Table Mountain. Speaking of which, it’s even possible to hike up Table Mountain itself, which offers a very different perspective of this world famous landmark than from the inside of a cable car. Being “out of season” also means there are fewer local tourists, meaning you can not only expect better rates and uncrowded world class beaches, but visits to iconic attractions, such as Table Mountain, Robben Island (where Nelson Mandela was imprisoned) and the V&A Waterfront, will be far more enjoyable with shorter queues giving you more time to explore and enjoy each location at your leisure without the hustle and bustle of crowds. If you’re in the mood to venture farther afield, the award-winning South African Cheese Festival takes place over three days at the end of April annually and offers a dazzling variety of cheeses that you can pair with some of South Africa’s finest wines and local produce. Held in the beautiful little town of Stellenbosch, roughly an hour’s drive away from Cape Town, it’s quite possibly the most picturesque setting in the Cape. Surrounded by the Stellenbosch Mountains, be sure to make time to take a tour of at least one local wine estate and soak up the views across the Jonkershoek River Valley. Normally a hive of activity in the summer months, April represents a shift in in mood as well as in seasons, and with so much to discover, it really is the best time of year to visit Cape Town. Santiago, Chile, is one of the best cities to visit, specifically in April because the weather is gorgeous. While it’s our spring, it’s autumn in Chile and harvest time in the vineyards of nearby Maipo Valley. Fewer tourists mean travelers are free to explore the capital’s diverse neighborhoods, ranging from artsy and bohemian to modern and hip to classically historic. Many Santiaguiños spend considerable time interacting with friends and neighbors on the street, living their lives in public, which makes for great people watching and street photography. Santiagohas come a long way over the last fifteen years or so, transforming from a polluted, run-down Latin-American capital into a modern and sophisticated cosmopolitan city that feels surprisingly European. Visitors will love the city’s phenomenal restaurants, boutique hotels, architecture ranging from historic colonial to uber modern, unique museums like the world-class Museum of Pre-Columbian Art and Museo de Bellas Artes, bustling markets, and lively social and music scenes. History buffs will enjoy colonial-era sites such as the Metropolitan Cathedral on the Plaza de Armas, the Casa Colorada (a handsome 1769 structure that is home to the Museum of Santiago), and the park of Cerro San Cristobal. After spending a few days in the city, it’s easy to travel to the coast at Valparaíso, tour wineries producing some of the best wines in the world, or go hiking in the nearby Andes mountains. Those interested in exploring farther afield might head up north to the starkly beautiful Atacama Desert, or make the flight down to Punta Arenas for a visit to the incredible Torres del Paine National Park, a World Heritage Site that captures the heart and soul of wild Patagonia. Those seeking a real adventure might travel by car or motorcycle down the Carretera Austral from Puerto Montt, through central Patagonia and the new national parks which added an area the size of Switzerland to Chile’s park system. Oklahoma City is most beautiful in April when the trees have bloomed and the weather is at the perfect temperature – mid 70’s most days. The Oklahoma City Zoo & Botanical Gardens celebrates spring with their annual Zoo Blooms event, where more than 100,000 tulips cover the 119 acres that’s nationally recognized as one of the top Zoos in the nation. Adventure happens each weekend in April at the Oklahoma City Boathouse District – home to the U.S. Olympic and Paralympic Training Site for rowing and Canoe/Kayak. 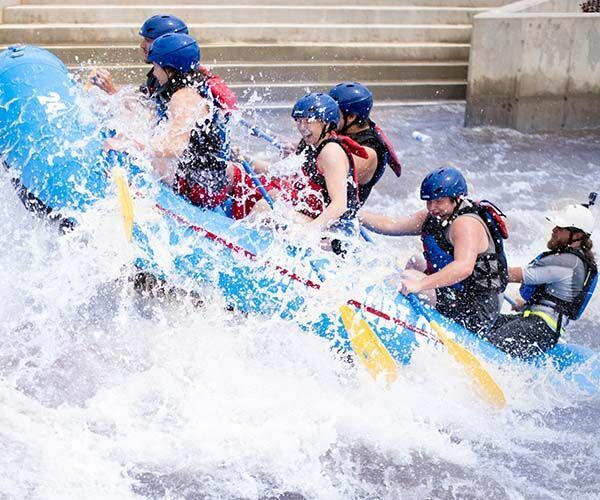 Just two years old, Oklahoma City offers one of the only urban whitewater rafting and kayaking centers in the world; just steps away from the Bricktown Entertainment District with views of the OKC Skyline. Families can take on the Class II &VI rapids with some of the best raft guides around. After an hour of fun on the water, take on the six-story adventure course – The Skytrail. Once up top you can zip-line across the Oklahoma River and back, free-fall 80-feet down or you can take on one of four of America’s tallest dry slides down. There’s also plenty to entertain the little ones or the ones not so daring. Grab a canoe, kayak or paddle board and enjoy water activities or get on land and enjoy 13 miles of biking and walking trails. If you’re a sports fan, the Oklahoma Thunder play two home games – which could be more once playoffs are announced – fingers crossed. The Oklahoma City Dodger’s – the triple-A affiliate to the L.A. Dodgers kick off their season with 12 home games and OKC’s Energy F.C. have two home games. The Festival of the Arts is OKC’s celebration of visual, performing and culinary arts and packs in plenty of family fun for six days with an average of 750,000 attendees. The popularity of the Festival is most often enjoyed toward the end by the 24,000 plus attendees in Oklahoma City running in the Oklahoma City National Memorial. The Marathon takes place April 30 and is a tribute to those who were killed, those who survived and those who were changed forever in the April 19, 1995 Murrah Bombing in Oklahoma City. April is an ideal time to visit Florence, and it’s definitely more relaxing than visiting during peak summertime, when the streets are full of tourists. April falls in the shoulder season, which means hotel rates approximately 20-30% lower, so you can upgrade your stay for the same spend. Since the city is so compact, visiting during this period affords the opportunity to stroll the streets, without encountering crowds, and even more importantly, allows for visits to two of Florence’s most famous and popular museums, The Galleria dell’Accademia di Firenze and The Uffizi Gallery Museum, to be enjoyed at a significantly more leisurely pace. Florence is a city known for its craftsman and there are incredible shops with leather and other craftsman using time-worn techniques handed down for generations. Each April artisans from around the world descend on Florence for The International Handicrafts Fair. It’s an incredible opportunity to admire and view the handicrafts of master craftsmen from around the world. This will be the 82nd year for the fair and it features everything from historic to modern and ethnic crafts and hand-made items. It’s really fantastic to look at all the incredible items on display. Another unbelievable experience that you can only have in Florence in April is celebrating Easter in Florence’s famed Cattedrale di Santa Maria del Fiore, or “Duomo” cathedral, the green-and-white striped cathedral that is central to Florentine life. Celebrating Easter in Florence is an incredibly unique experience, as they celebrate the holiday with “The Explosion of the Cart,” a tradition that dates back 300 years. It begins with white oxen leading an elaborate, nearly 30-foot cart from Piazzale del Prato to Florence’s Piazza Duomo where it sits between the Baptistry building and the Cathedral. Around 11am, as part of the Easter Mass being celebrated in the Cathedral, the Archbishop of Florence at the altar lights the “Colombina,” a rocket shaped like a dove. There is a cord that runs the length of the Church, from its choir to the cart outside the church entrance. The flare slides along the cord, and hits the cart, setting off the fireworks before returning backwards. According to tradition, if the Colombina returns all the way back to the altar the year will be positive. It’s quite a cultural experience that many tourists don’t get to see. There is no better time to visit Jerash than April. April falls perfectly between two busy tourism seasons – the rush of Easter and Spring Break in late March, and the beginning of the summer tourism season in May, which sees the biggest influx of expat Jordanians and tourists from the Gulf countries. While crowds may be a nice lively addition to many tourist experiences, there’s something magical about seeing Jerash on a quiet day. When nobody is around, you can explore the ruins at your own pace and really imagine what life was like in the first century. And if anything can make your visit to Jerash even more perfect, it would be the amazing weather in April. Since Jerash is located in the mountains in the North of Jordan, the weather is cooler than in Amman, Petra, and Wadi Rum in the south. While March is nice, the weather can be temperamental, and cold temperatures could maim your experience. Starting in May, the infamous Jordan sun comes out to play, and temperatures in the middle of the day will become almost unbearable the further you get into Summer. In the midst of spring, the north of Jordan is in full bloom thanks to the recent ending of the rainy season. The lush rolling green hills look almost fake, creating a perfect backdrop to the famous Roman ruins. Once summer starts, that greenery will be fried by the sun into a dusty brown. Not only will Jerash have you seeing green in April, you’ll be eating green as well. Spring, and April in particular, is when a few favorite local crops are perfect for picking. The first is green almonds, or loz akhdar in Arabic, plucked and eaten directly from the tree. Don’t let the green fuzzy outer layer scare you, these crisp delicacies are usually smothered in lemon juice and dipped in salt to optimize the tartness. Even rarer are green chickpeas, called hamleh. These are eaten raw, straight off the branch where they are light and refreshing, or grilled and doused in salt and lemon juice for a unique street food. The window of time for catching these treats at optimal ripeness is short – only a few weeks in April. Wait too long into May and they will already have ripened. April is the perfect time to visit Budapest. The weather in the Hungarian Capital is starting to warm, and the city puts on a colorful gown. Easter is a big event in Budapest and traditional Easter Markets spring up on every corner, selling delicious treats and handmade souvenirs. Vibrant flowers decorate the gardens and houses, stunning landscaping, and even a Cherry Blossoms Festival make you forget that you are in a big city. And the best part? You can enjoy them more or less for yourself and with locals, as during April the city is not quite as overrun with tourists as during the summer months. You can enjoy a more authentic experience during your visit and immerse yourself into the Hungarian culture. Food is always a great way to learn more about a different culture, and Hungarian dishes are no exception. In this country, Farm to Table is not an innovative concept, but how it has always been. From traditional dishes like Paprika Chicken to Goulash, to innovative Chefs that turn these comfort foods into a fine dining experience, Hungarian cuisine – especially in Budapest – has a lot to offer. A great way to learn about Hungarian food is to visit the Hungarian Handmade Flavors Fair, which also takes place in Spring. At the Flavors Fair, you can sample and try all these Hungarian delicacies. But April is not only the best time to see the beautiful gardens and eat your way through Budapest, it is also a great month to enjoy a variety of cultural events and festivals. The Spring Festival is a cultural highlight that lasts about 4 weeks in March and April. With 130 events, ranging from Jazz to Classic, World Music, Dance, Theatre, and Visual Arts, the Spring Festival has something to offer for every taste and cultural preference. If this is still not enough culture for you, the Budapest Book Fair also takes place in April and you can learn more about local and international literature and authors. The Budapest Art Week is another cultural highlight, where galleries and museums put on special exhibitions and you can do guided Art Walks that show you the best ones while teaching you about the local Art scene. These festivals and events are offered on top of the already plentiful cultural events that take place in Budapest throughout the year. April is a great month to visit Budapest and has a lot to offer during the spring months. So many good ideas, thanks. I wasn’t aware of Rome’s birthday, whilst Japan and the blossom season has been on my bucket list for ages. I loved Barcelona and Cape Town, would love to go again. I’ll be roaming around Tokyo to enjoy the cherry blossom sakura. Barcelona sounds interesting would love to go there too!! April is a great time to visit Barcelona. If you head up to the hills, by the Olympic Museum, there’s a fresh green tinge to the city as you look down. Barcelona can be hard work in the heat of the summer but April is a comfortable time to visit. Though on the other hand the football season is hotting up. If you can beg a ticket to the Nou Camp you could see one of the great games at the business end of the season.